Tea with a Baba – snackettes. If there is one lesson that I have learned about traveling, it is this: never can we plan the most memorable moments of our trips. 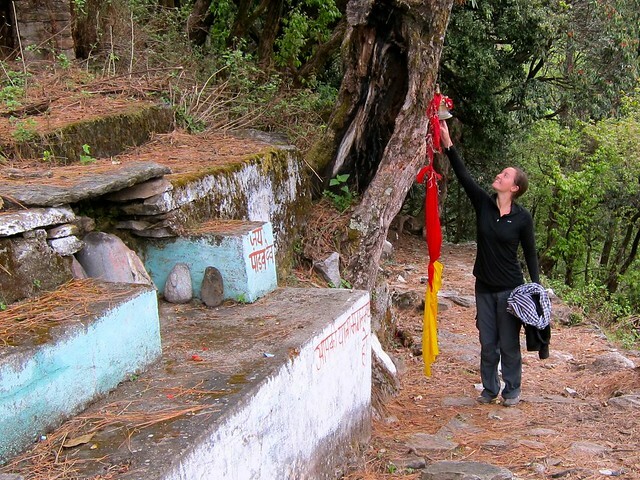 Our hike that day in Gopeshwar (India) had started out like any other hike on our trip. 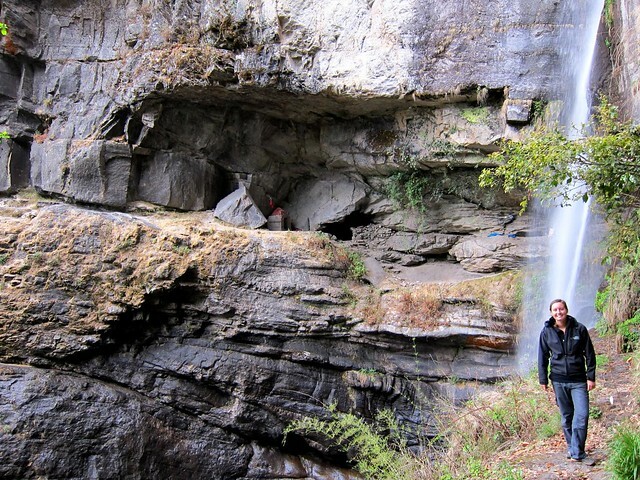 Our guide for the day, Rishidash, wanted to show us a waterfall high up on a mountain in a remote area of northern India. Finding it, he said, would require passing through a small village and then climbing a steep path for several hours. We set out in a light rain early that morning, with Rishidash walking far ahead of us (as our guides always seemed to do). We passed through the village built of tiny one-room concrete homes, set in a lush valley with rivers running along its western bank. 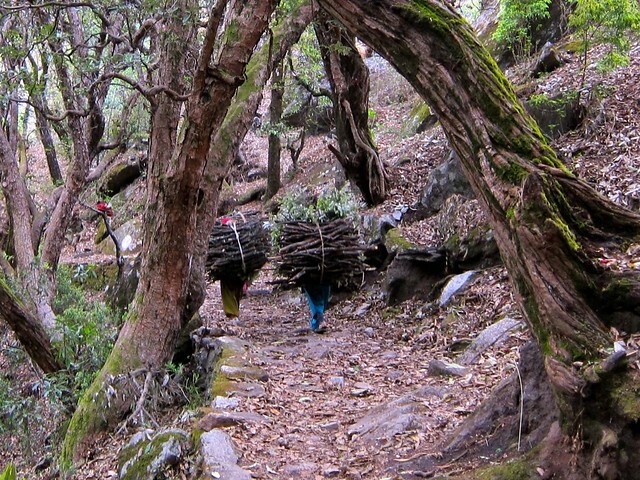 Eventually, we reached the base of the mountain (we didn’t catch its name), where women carrying heavy loads of sticks piled high on their backs were just finishing their morning shifts. 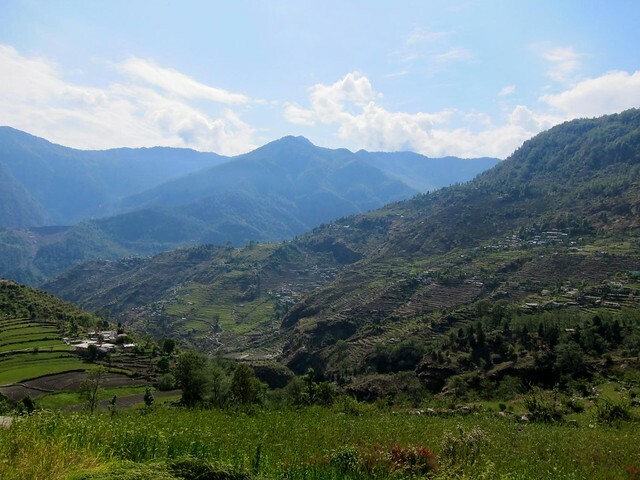 We began winding up the meandering rocky path, full of tight switchbacks, and we could occassionally steal glances of the beautiful valley and the now dollhouse-like village that we had just passed through. After a couple of hours of climbing, we passed through an old monastery set near the top of the mountain; we thought we had reached the top of the mountain (we had indeed rung the monastery’s bell at the top, proving that we had made it..), but mysteriously more and more trail kept appearing in front of us, and we kept winding our way higher and higher up its face. As we were crossing over a small stream using a felled-tree, I noticed a purple tarp pulled across the front of a cave to our left, with some bright yellow cloths scattered about the rocks. “Do you think someone is living in there? ?” I whispered to Scott, wondering why someone would choose to live so remotely and humbly. Then I noticed the miniature solar panels that were set up just outside the cave entrance… some pretty well-off hermit, I suppose. We stared at the set-up for a few seconds and shrugged and continued in the direction of the waterfall. We eventually came around a bend and found ourselves halfway up the face of the massive waterfall. We continued walking along the path toward the fall, when we found ourselves blocked by a rockface wall with nothing but a sheer drop (that must have been over one hundred feet long) to the right. Wondering how we would navigate around this wall, Rishidash pointed to the downward-facing arrow that had been spray-painted on the wall in front of us. 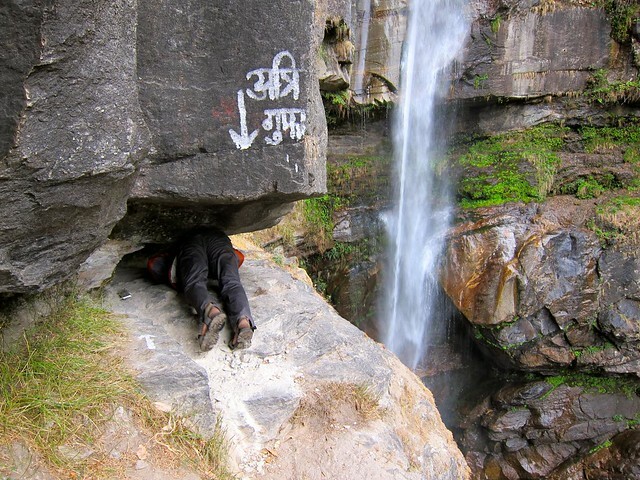 We couldn’t read the Hindi writing that was next to it, but Rishidash’s movements told us all that we needed to know: we were going under the rockface. 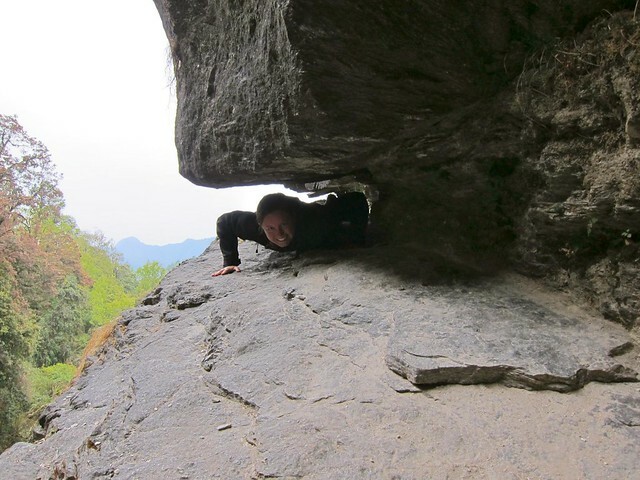 RIshidash went first, pulling himself through the tiny crawlspace below the boulder. As Scott began pulling himself under the rocks, my heart began pounding harder and harder, my palms sweating profusely… Being claustrophobic, this was my idea of torture. When I could see Scott’s feet stand up on the other side of the crawlspace, I took a few deep breaths and dove right in– I knew that if I hesitated for one second longer, I wouldn’t do it. 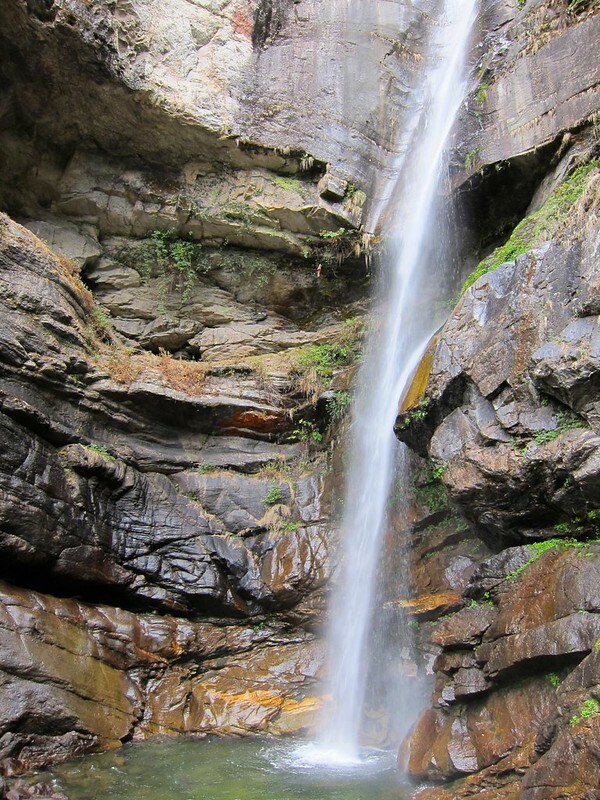 I began pulling myself along the cold rough rock floor, slightly wet from the spitting mists let off by the waterfall. It was much harder than I had imagined; my instinct was to lift myself to my knees so that I could crawl, but there simply wasn’t enough room. I would try to lift up, only to have my lower back hit the rocks above. I knew I’d have to continue flat on my belly or not at all. 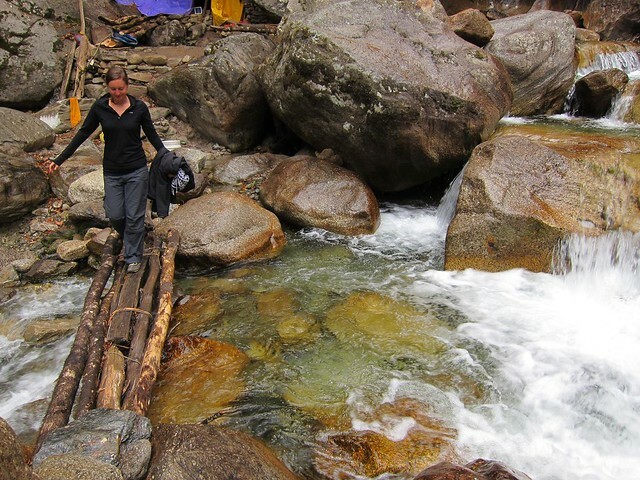 My only means of leverage was to use the very tips of my fingers to dig into the rocks and to push myself along inch-by-inch with my toes, scraping up my clothes in the process. I was terrified of having a claustrophobia-induced attack, so I pulled and pushed and slithered the whole way with my eyes completely closed… which might seem like a good idea, were it not for the sheer drop-off that hung only inches away from my right. Unfortunately, the rock floor was slightly slanted towards the drop-off, and I could hear Scott coaching me as I crawled toward him at an awkward angle with my eyes shut: “Left! Go more left!!!”. In less than a minute, I was through. I want to say that it felt exhilarating to have it behind us, but I knew that to get home, we’d have to pass through it one more time on the way back. 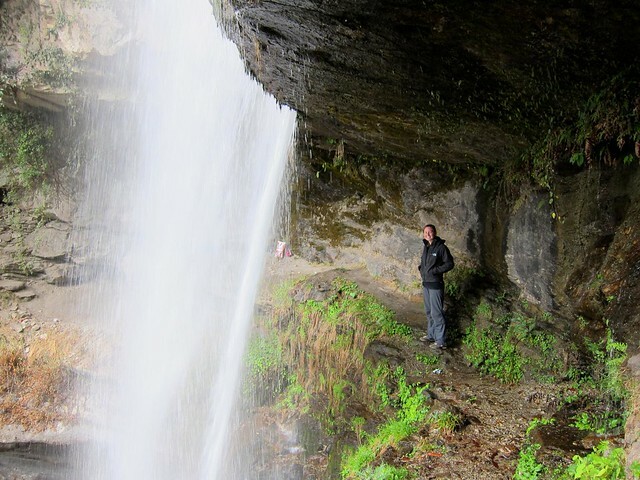 Needless to say, my enjoyment of the waterfall was dampened; it was one of the tallest waterfalls I had ever seen, but I was filled with such incredible anxiety and trepidation, afraid that I physically wouldn’t be able to go through the crawlspace even one final time. I would, forever, be stuck on this side of the waterfall. Although I’ve seen a few waterfalls in my life, this one was truly special. We were able to walk behind it, half-way up the wall of water and watch it hit far below. We were never able to capture its full height in the camera lens, and it was much more more impressive than it appears in any of our pictures. Rishidash had us crawl down onto some rocks in the pool of the waterfall itself, and –voila– there was indeed a second trail that led out of the falls and back to the original trail! Scott cautiously approached the cave and stuck his head inside the tarp, as I stood back and watched. Suddenly, Scott’s face retreated as quickly as it had entered – “The baba is home!” he exclaimed, just as a stern-faced man wearing a faded orange beanie beanie and a green cloak poked his head out after Scott. The baba was definitely home. And he was not happy about us poking our faces inside his house. 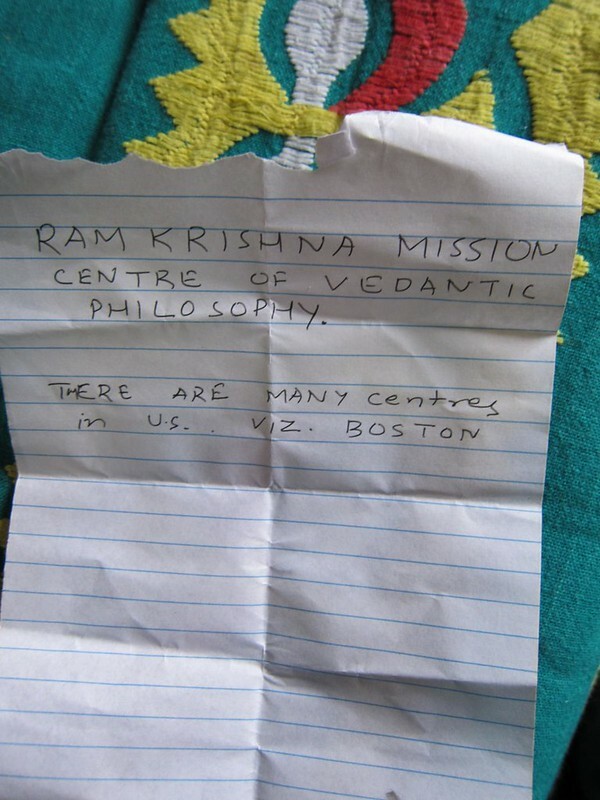 Rishidash quickly began speaking in Hindi, trying to offer an explanation as to why we had just invaded his space. The baba stood silently as we all listened to Rishidash’s tireless excuses, embarrassed for the situation that was unfolding. After the baba had heard enough, he reached into his cave and pulled out a faded, brown notebook. He flipped to an empty page and began writing. Rishidash began looking over the baba’s shoulder, nodding and answering whatever the baba was writing on the notepad. “Wow. 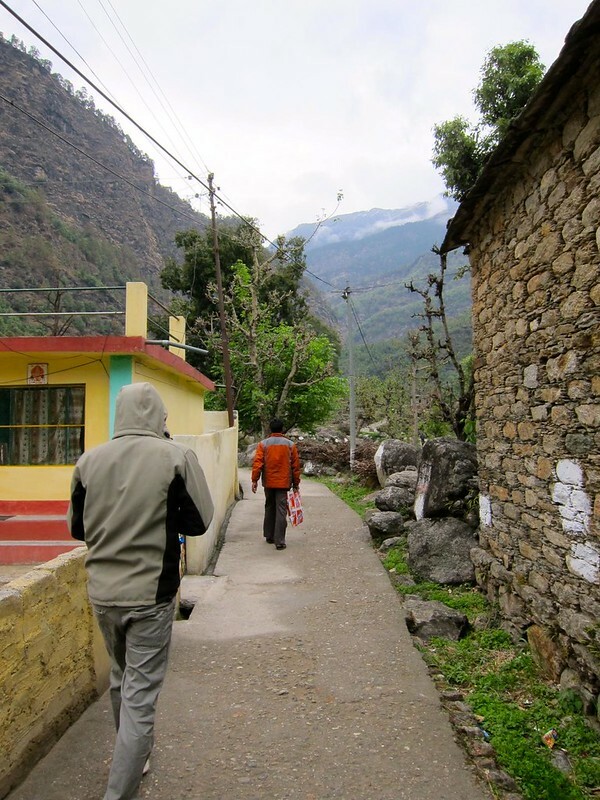 I think he’s taken a vow of silence!” I whispered to Scott, perhaps a little too loudly, although I figured the baba didn’t speak English anyway– he certainly would have been one of the only people to know English in our last 2 weeks of traveling through the state of Uttarakhand. The baba turned to look at us next. He had a kind face, and his smooth brown shiny skin and soft brown eyes made him appear years younger than his greying beard implied. His curved lips were pursed in a way that made him seem like he were constantly on the verge of spilling a private joke. Red and yellow lines of paint decorated his forehead, and his bare toes spread in such a manner that suggested he had never worn a closed-toe pair of shoes. Shocked that he knew English (let alone, written English), Scott and I laughed and eventually gathered ourselves enough to reply “America.” The baba smiled and wagged his head in approval. 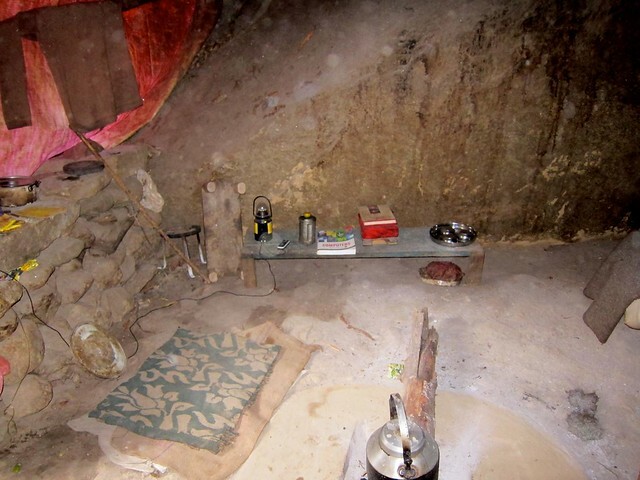 When we said we would love a cup of tea, he motioned for us to remove our shoes and leave them outside of the cave. He led us inside in our stockinged-feet and unrolled a green straw mat on the cave floor for us to sit on. My eyes took several minutes to fully adjust to the darkness, and for those minutes, I simply sat in the pitch dark in this baba’s cave, in the middle of India, and just smiled. There are a handful of moments from our travels that I look back on with that feeling of completely surreality. This was one of those moments. With questions swirling in my head (“Where am I?” and “How do I wind up in these situations?”), I slowly began to make out the various shapes around the room, while the baba busied himself gathering firewood for our tea. To our right was another low platform in a very dark corner of the cave; apparently, this was where the baba had been meditating when Scott poked his head into his hut and woken him up. The baba eventually returned with the firewood and began pouring water, milk creamer, tea, pepper, and other spices into a silver pot that was set on top of the fire. Laughing, we answered with who we hoped would win the next election in November. After a few minutes, I gathered the courage to ask him the same question. He motioned to both of us and nodded– his answer was the same. 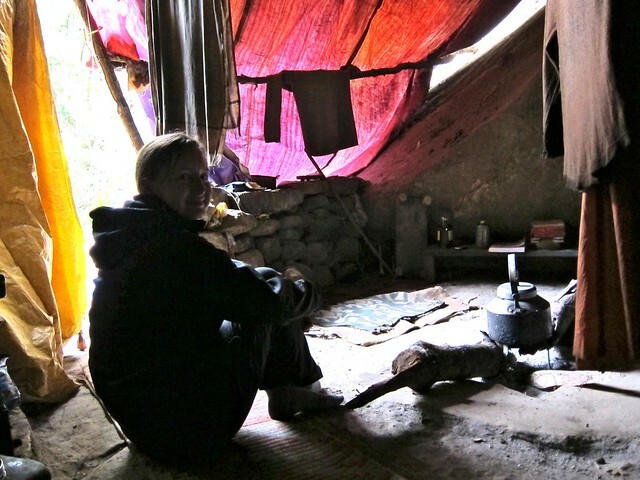 He laughed and gave me a look that said “Do I look like I live in a cave or something?”………. “M.I.T.”, wrote the smiling Baba. “Haha, yes! And do you know Harvard also? I went there!”, I said, which was answered by a big head-wag from the baba. The baba held up a single finger. While we waited for the tea to boil, the baba made us some tiny sandwiches by spreading strawberry jam on some round crackers. Perhaps I was just hungry from our hike, but the jam was the best I’ve ever tasted. When the tea was finally ready, we were busy chatting away with Rishidash, who had just learned that I was a biologist (so is he, apparently). The baba began snapping his fingers at us to get our attention so that we could hand him the tea filter that was sitting behind us…we quickly obliged! He filtered the hot milk tea and poured it into 4 small steel cups, passing one to me first and then Scott. The baba simply pointed to the sky and smiled. We sat in silence for a few more minutes, then I leaned over to place my empty tea glass on the hearth surrounding the fire. The baba shook his finger at my cup vigorously, still managing to remain silent– apparently the hot cup was bad news for his newly constructed cowdung hearth. I apologized profusely, quickly pulling it back onto the rock floor. Then he tossed a piece of charcoal into each of our glasses and instructed us to swirl them around to clean the glasses. Then we followed him out the entrance of the cave to the river nearby, where we gave the glasses a final swish and declared them clean. Having a look at his mobile was the least we could do to thank him, so Scott followed him back inside the cave. Scott found the charger properly plugged into the solar panel that we had seen sitting outside of the cave, but he instantly figured out (from our past week in freezing Chopta) that the phone battery was simply too cold to charge properly. Scott rubbed the battery in his hands for a few minutes, and voila! It started working. The baba was grateful. We thanked the baba for his generosity and turned to go, but he waved us back once more. 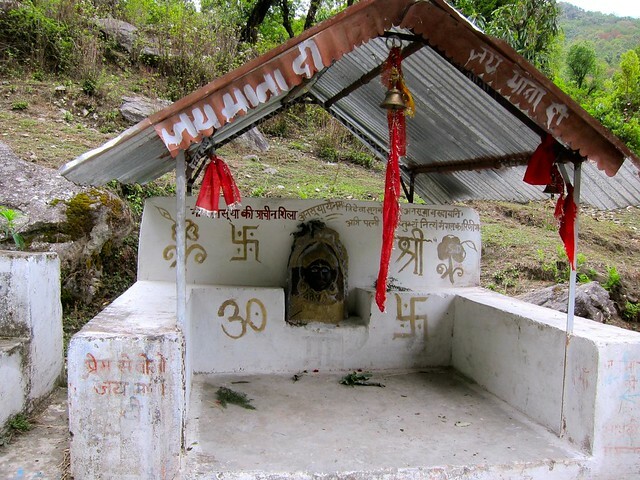 We again thanked the baba for his generosity and turned with Rishidash to continue on our long hike home. 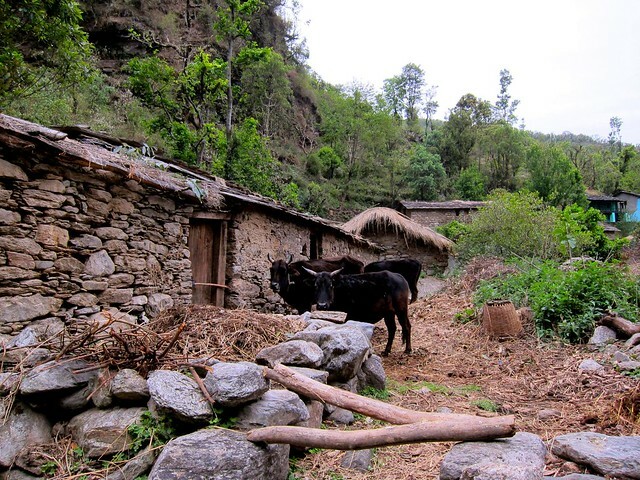 That night, we settled back into our homestay in Gopeshwar, where Rishidash and his family lived and were providing for us. Normally, the women prepared humble but delicious meals for us consisting of rice, yellow lentil soup, hot chai, salted cucumbers, and curried vegetables. 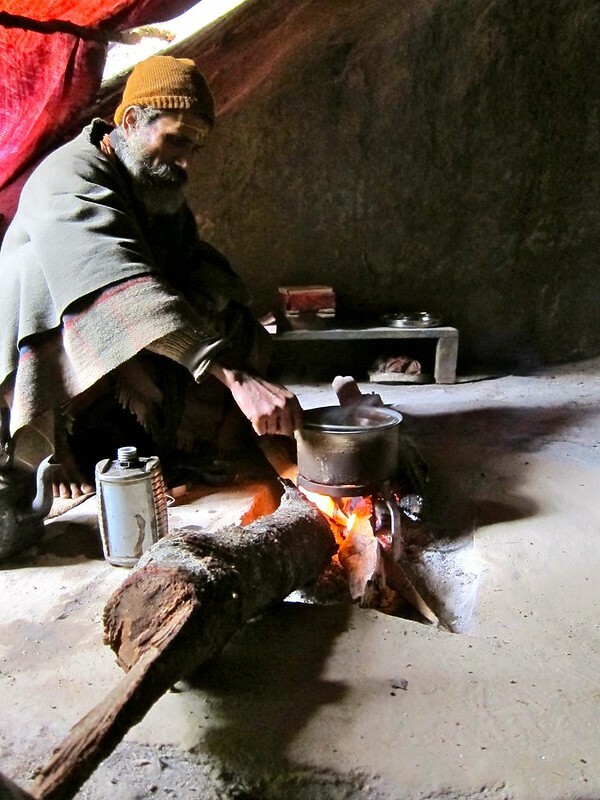 Although our trip with Rishdash did not cost us that much, the payment seemed to be a welcome treat for his family, and that night we and the family were dining on thick, grizzly cuts of roast mutton… As I gnawed away at the spiced mutton bones by candlelight, thoughts from the day swirled in my head: …”a little problem on bio-computation of the human mind”??? A random woman from Colorado? Had the baba gone off the deep-end? Had he really been an eye-surgeon at all? And, What kind of insight did I really need?? ?